Panorama Hills is a large neighbourhood in NW Calgary with great real estate options for many budgets. It is a newer community that was developed in 1997 by Genstar, who is also known for developing older communities like Willow Park and Lake Bonavista and newer ones like Walden and Chapparal Valley). Panorama Hills real estate is mostly detaches houses, but there are a few condo complexes also. Browse all current home listings in Panorama Hills here, and read more about this NW community below. North of Nose Hill Park is the large community of Panorama Hills. 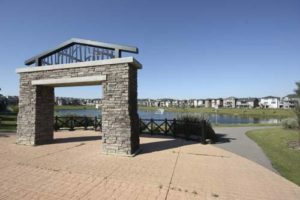 It is located west of Harvest Hills Boulevard, east of Beddington Trail and Stoney Trail and north of Country Hills Boulevard. Panorama Hills is surrounded by the communities of Coventry Hills and Country Hills Village (to the east), Evanston and Hidden Valley (to the west) and Country Hills (to the south). Proximity to major transportation routes makes for quick commutes to all parts of the city and a short drive to downtown. Especially with the new ring road, Stoney Trail, the accessibility to the community has been steadily improved. Calgary Transit serves the community well with the Panorama Hills express route (142) and the rapid bus route (301). Panorama Hills features a few small lakes and many pathways for pedestrians and cyclists. Most residences in the Panorama Hills real estate market are detached single family homes, but there are also some condominium complexes like Panorama West, Pointe and Heights. Panorama Hills amenities include a community association, playgrounds, pathways, tennis courts and skating rinks. There are several schools in Panorama Hills, including Panorama Hills School and St. Jerome School. Retail in the Panorama Hills community is located at The Gates of Panorama Hills along the northern side of the community. Just to the west of Harvest Hills Boulevard, Country Hills Village offers a lot of retail, restaurants and amenities. If you are considering buying real estate in Panorama Hills and want to have information on crime rates in this community, visit the Calgary Police Department website. If you would like to learn more about the real estate market in Panorama Hills, feel free to contact us anytime!